Maine waterfront rental sitting on the oceanside of Quahog Bay! 3 bedroom, 1.5 bath cottage with sunrise views and deck! 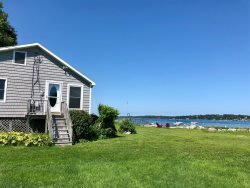 Enjoy Maine's peaceful coast at it's best at this beautiful home located just steps from the ocean. This location cannot be beat! Walk into the bay from the edge of the lawn or swim off the deep water dock perfect for your boat! As you make your way into the nautical-themed house you will find yourself on the level with all the bedrooms. The master bedroom offers fantastic sunrise views with wall-to-wall windows equipped with light-blocking shades. Appreciate a brand new 32" flat screen TV with a blu-ray player also in the master bedroom. Also on this level you will find another bedroom with amazing views equipped with a full size bed and a twin bunk bed. The last bedroom does have limited ocean views and two twin beds. A full spacious bathroom with a tub/shower combination is also located on the floor with the bedrooms as well as a washer and dryer for your convenience. Make your way down the staircase to a beautiful open living space. Cook your favorite lobster dishes in the nicely equipped kitchen that opens up to the dining room with awesome ocean views. An airy open living room with high ceilings and large windows allow you to watch the lobster boats go by from inside the house. The living room also offers great amenities such as a 40" flat screened TV, a DVD player, an indoor/outdoor stereo system and a gas fireplace for the cool nights. Outside on the deck you will find plenty of seating for everyone and a great outdoor dining space with a gas grill. Play yard games or have a fire in the fire pit on the flat spacious yard near the ocean! ** Please note: Although on the map it says Pennell Lobster is next to the house please be aware that it is not a big lobster wharf. There are only two commercial boats and not a working wharf. Orion's Landing was a wonderful home with an amazing view. Often I felt like I was on a houseboat. The house was very clean, stocked with all we needed (and much more), and homey. The only thing I could wish for was walk-ability. A car is needed to pretty much go anywhere, even for a long walk. If there were a safe road or path outside the door enabling long walks, then it would have been pretty much perfect. We loved the location and the property had all the amenities you could desire - docks, fire ring, beautiful deck, ample outdoor seating, gas fireplace, etc. We loved this property! ...the surrounding area, neighbors, deck, lawn and the interior of this rental. We loved waking up to the water right outside every window upstairs and downstairs! We loved sitting on the deck, and the very cool lobster chairs.